Spencer Savings Bank was named a “Champion of Good Works” by the Commerce and Industry Association of New Jersey (CIANJ) at its recent Chairman’s Reception, saluting the generosity of the business community. Kafafian presented Spencer’s award to Janel Bazih, Vice President of Marketing, to commend the bank’s sponsorship of the New Jersey Financial Scholars Program, a partnership with EverFi Inc. that has brought a financial literacy education program to New Jersey elementary and high schools. The coursework, which is presented as a 6-8 hour online program, is designed to provide students with the tools and knowledge they need in order to make smart financial decisions. Spencer employees also visit the classrooms during the year to engage with the students, returning at the conclusion of the course to congratulate them and present their certificates of achievement. During the 2014/2015 school year, a total of 1,403 students were able to benefit from the financial literacy program. 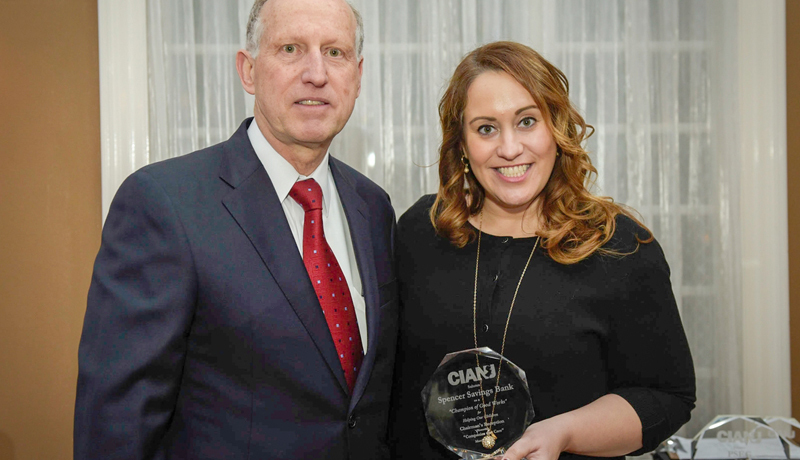 CIANJ is a statewide business advocacy organization based in Paramus. It represents more than 900 member companies from every business sector. The association asked businesses to submit stories of their good works and more than 90 responses were received this year. These accounts and pictures are featured in a special “Companies that Care” section of the March issue of COMMERCE Magazine, the media arm of the association. A panel of judges reviewed all the submissions and selected the champions. The judges included: Cathleen Davey, Executive Director of the Ramapo College Foundation, John Galandak, President of CIANJ, Jackie Lue Raia, Assistant Director of the NJ Sharing Network, Cindy Myer, the owner of Ridgewood Moving Service who also serves as President of the Board of the Center for Hope and Safety; Jacey Raimondo, Executive Director of the Habitat for Humanity of Bergen County, Judi Stewart, an Ambassador with the CIANJ Human Resources Council, and Tom Toronto, President of Bergen County’s United Way.